1. Are you replacing heaters more then once a year? 2. Do you hear a loud noise when the safety valve opens? 3. Does it take longer than 15 minutes to build pressure? 4. 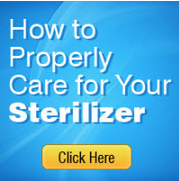 Do you find the sterilizer ON when you arrive to your office in the morning? 5. Does the yellow light (heat light) stays off frequently? 6. Are bags being burned? 7. Does the temperature gauge passes the 270 degrees mark? 8. Does water leak from the door unless you press down on the door handle? 9. Do you have to replace door gasket frequently? 10. Are the trays totally black & burned? 11. After pressure builds does it begin to drop? 12. Did someone tell you that your chamber has a hold in it and is not worth repairing? Click here for Details to find out what we can do for you.